Crispy thick-cut bacon!! 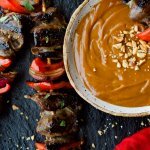 The kind, while cooking, fills your home with an enticing aroma that can only be satisfied by a piece of that salty goodness landing on your tongue. What could possibly be better? Well, let’s see! 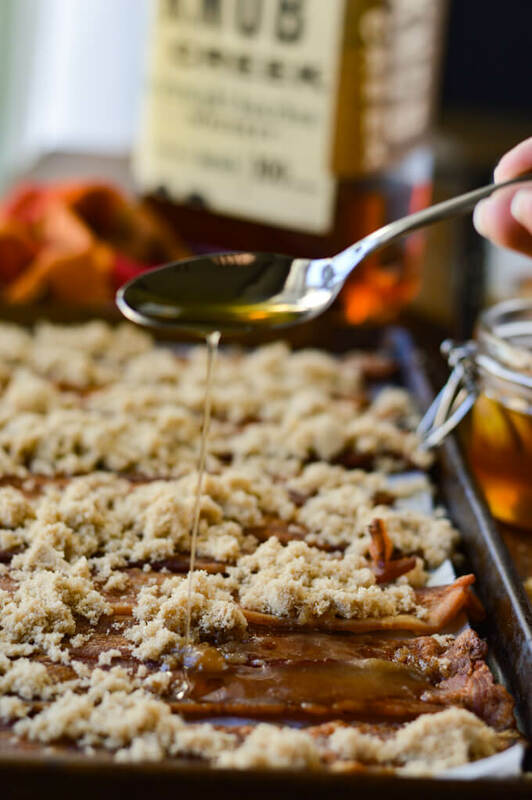 Maybe … a strip smothered with brown sugar, honey, and bourbon. 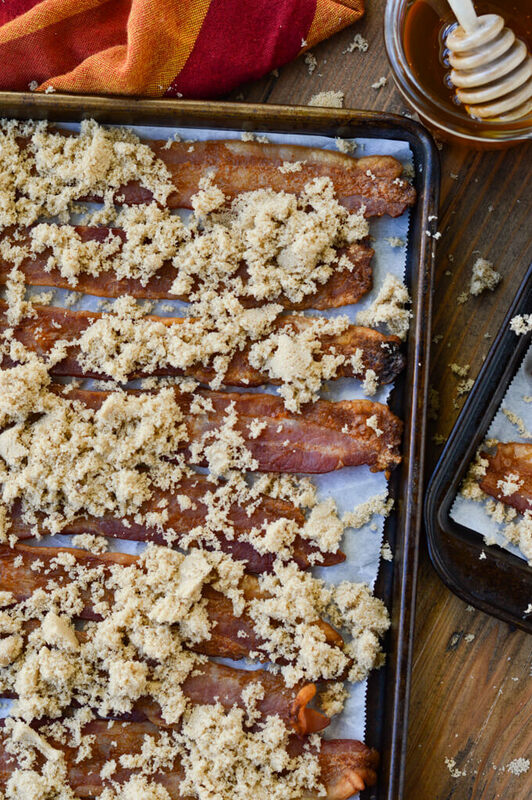 Candied to a perfect gooeyness yet still keeps the crunchy crackle of the bacon itself. This, my friends, is the ultimate mid afternoon hunger buster. Be prepared though, you’ll never be able to eat just one. Bacon …a universal food language that everyone speaks and everyone loves. It’s been said on a few occasions that bacon is just another word for “meat candy.” So let’s take it an actual step forward and make it so. Candied, that is. 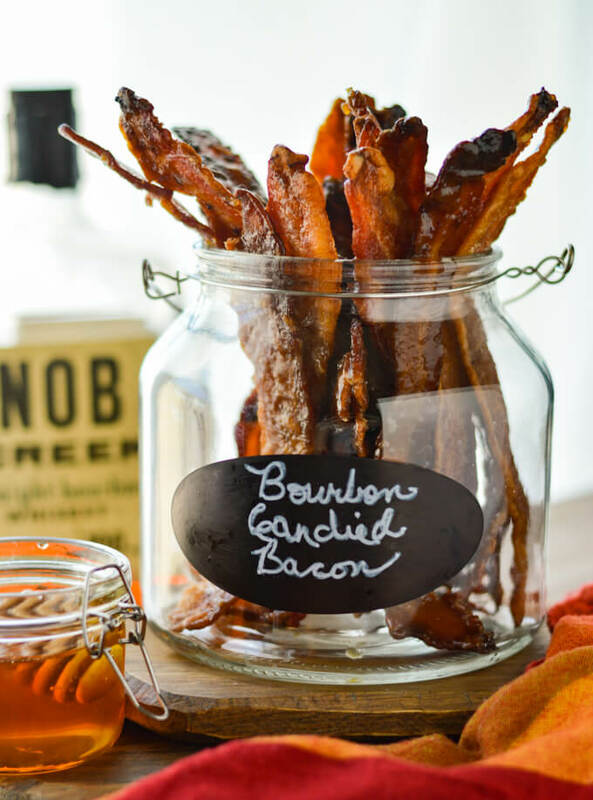 Who could possibly resist, sweet, salty and a little taste of bourbon kissing a crispy strip of bacon? This Candied Bacon is super easy to make and the clean-up is a breeze. From start to finish this recipe is made in the oven. Cooking the bacon and glazing it with the sugary goo, it’s all confined in one place. And you’ll love the cleanup because lining the sheet pans with foil allows you to fold in the mess when you’re finished and simply throw it away. 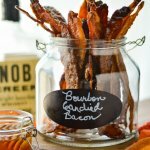 Candied Bacon is an irresistible appetizer for any party, especially the Super Bowl coming up. Everyone loves the combination of sweet and salty together. 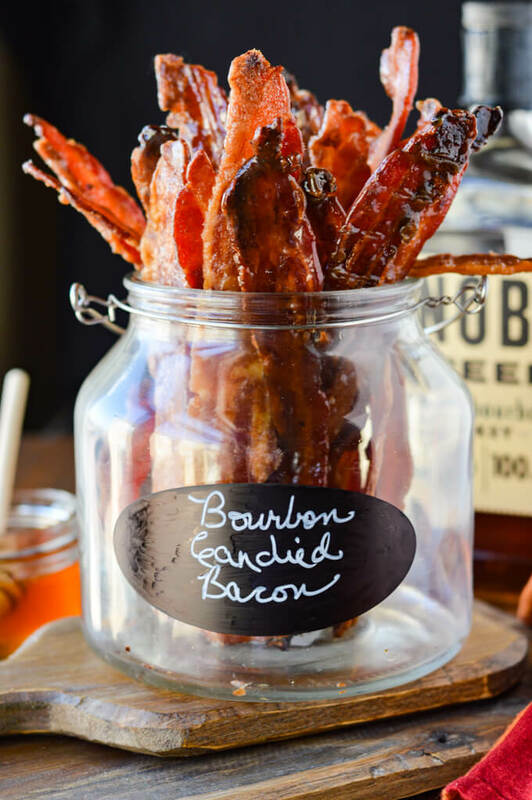 Then throw in bacon with a little bourbon, well at that point, it’s all over. 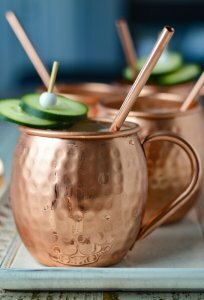 You’ll definitely want to make at least a double batch. These little gooey, crispy jewels go like hotcakes. 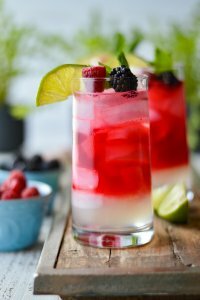 Your guests will be begging for more, I guarantee it. This is a great make-ahead recipe. 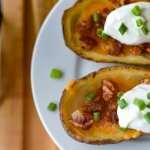 I love recipes that can be made in advance and are ready to be pulled out when it’s time to serve. There’s nothing like the chaos of trying to pull together a recipe at the last minute while preparing for a get-together. “Simplify” is the name of the game for parties. Candied bacon can be stored in the refrigerator for up to three weeks. 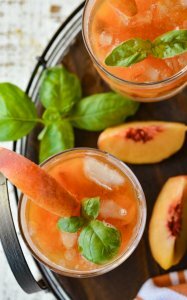 There are only four ingredients found in this recipe. Thick center-cut bacon, brown sugar, honey, and bourbon. How simple is that grocery list? Make sure and grab a package of thick center-cut bacon for this recipe. No WIMPY strips of bacon here! Also, you don’t want the bacon to be overwhelmed by the candied glaze. A nice balance of both the salty bacon with the sticky sweetness is what you’re looking for. Cooking Bacon in the Oven is the BEST kept secret! If you’re tired of the splatter of grease everywhere in your kitchen from the sizzling of bacon in the skillet, done with nursing whelps on your skin from the sputtering of hot oil or the hassle of constantly turning bacon slices, then I have a better option for you. You won’t believe how easy it is. Crispy delicious bacon cooked in the OVEN. I know what you’re thinking. No way can it be as good as regular bacon on the stove. Once you try it, you will never go back to the old messy way. For this recipe, use 2 cookie sheet pans lined with foil or parchment paper with a wire rack on top. (Don’t make the mistake I did by not putting foil down. What a greasy clean-up for me.) 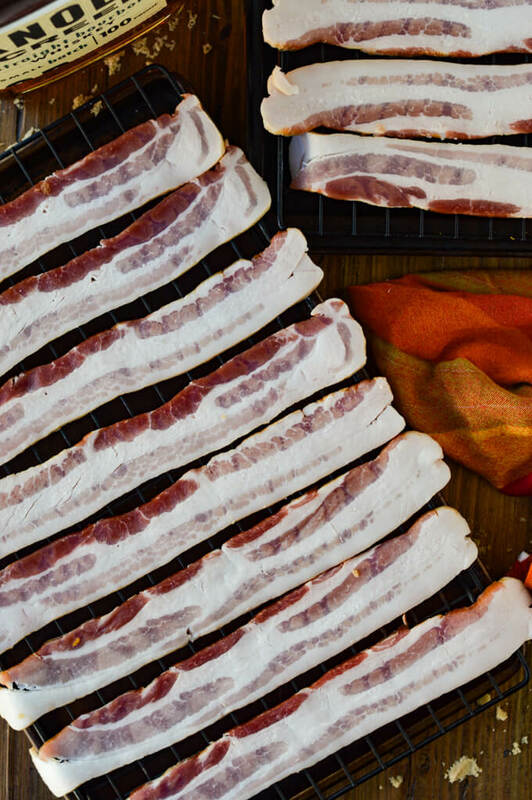 Individually arrange each slice of bacon on the wire racks and place them in a 425° F oven for 25-30 minutes or until somewhat crispy but not overdone. The wire rack lifts the bacon off the pan and helps to get each piece crispier. The heat surrounds both the top and bottom at the same time. And the beauty here is no need to flip the strips. When it’s fully cooked, remove from the oven and place each slice on a plate lined with paper towels for the bacon grease to drain. Once the bacon is cooked and cooled, line the same cookie sheets with foil or parchment paper again. Lay the bacon strips in a single layer on the wire racks. This is where the simple magic begins. Sprinkle the bacon evenly with brown sugar. It’s okay if some of the sugar falls on the parchment paper because the syrup will eventually soak the entire pieces of bacon. 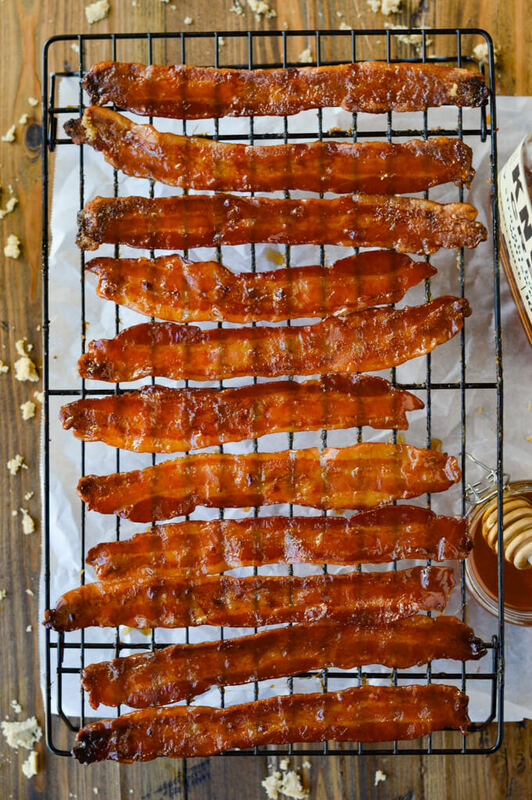 Next, whisk the honey and bourbon together and drizzle it over the sugar-coated bacon strips. It’ll seem like you don’t have enough bourbon to do the trick but as you drizzle it, the sugar will begin to soak it up. Once the bacon is coated, put the pans back in the oven at 425°F for another 10 minutes. When it cooks, the syrup will bubble up and create a syrup on and around the bacon. Be careful at this stage because when the candied bacon comes out of the oven it is extremely hot. I’ve burned my fingers a few times, learned my lesson and decided to use tongs instead. A wire rack works great to cool the bacon when you remove it from the oven. Lay down a piece of parchment paper under the rack for the syrup drippings that occur. I made these for parties on several occasions and they were gone in a flash. I’ve had people comment about how amazing they were months later. 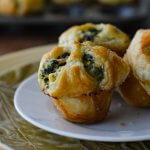 If you make these, say for a Super Bowl Party coming up, you might consider making a huge batch. You will be bringing the party with these gooey delights and people will consider you the “hero” of the evening. Which is never a bad thing. 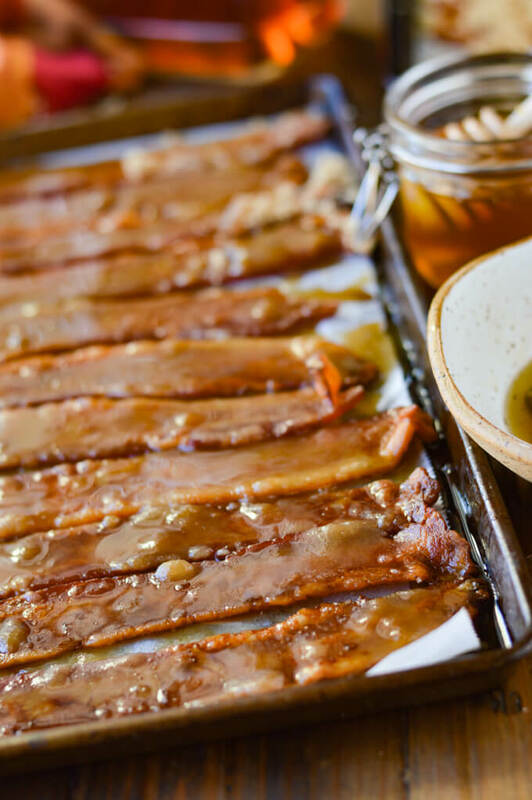 Bacon strips smothered with brown sugar, honey, and bourbon. 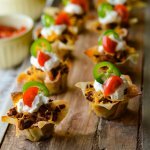 These delectable appetizers are candied to a perfect gooeyness yet still keeps the crunchy crackle of the bacon itself. Preheat oven to 425°F. Line 2 cookie sheets with foil or parchment paper. Place a wire rack on the cookie sheets. Individually arrange the slices of bacon on the wire wracks. Place in the preheated oven and cook for 25-30 minutes depending on how thick the slices are. The bacon should be crispy but not overdone. Using tongs, transfer the cooked bacon strips to plates lined with paper towels for draining the grease. With the same cookie sheets, add new foil or parchment paper and arrange the bacon strips in a single layer. Sprinkle the brown sugar over the bacon. Whisk together the honey and bourbon. 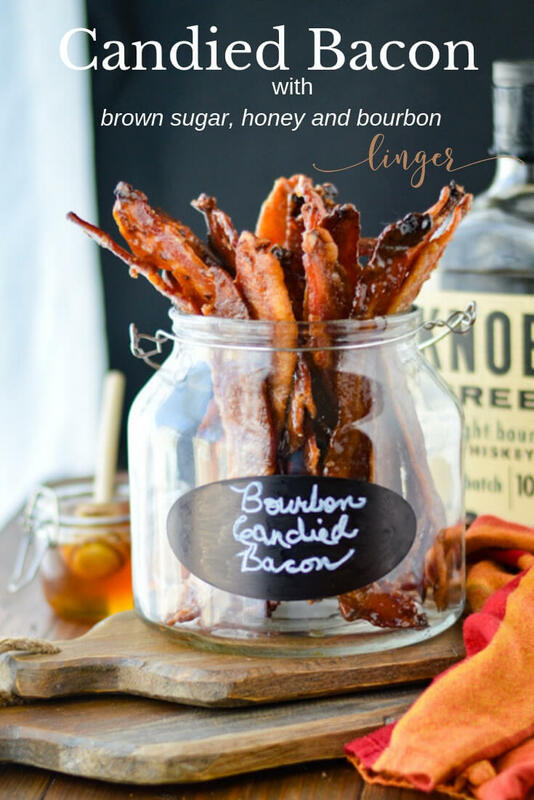 Drizzle the bourbon mixture from a spoon over the bacon covered with brown sugar. Bake in the 425°F oven for 10 minutes. Carefully remove the pans from the oven and transfer each strip of bacon onto a wire rack that has parchment paper under it. Let cool. 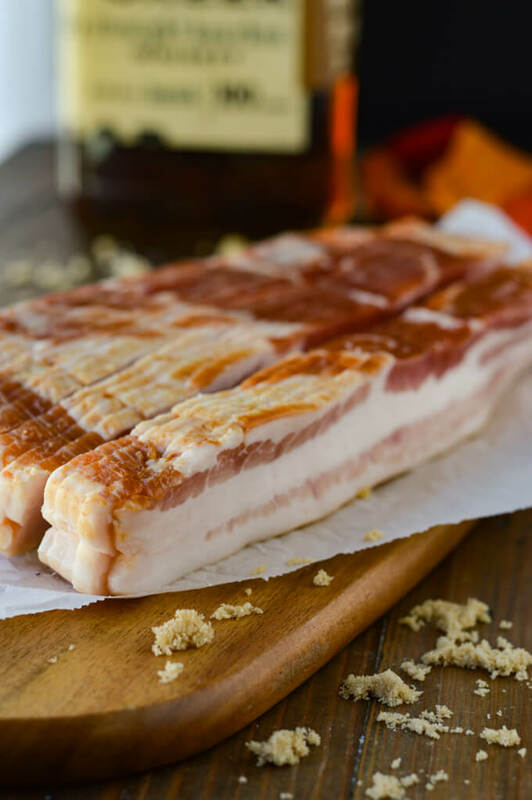 Make sure and grab a package of thick center-cut bacon for this recipe. You don’t want the bacon to be overwhelmed by the candied glaze. A nice balance of both the salty bacon with the sticky sweetness is what you’re looking for. Line the cookie sheets with foil or parchment paper. It makes for a much easier clean-up experience. When done cooking, simply fold up the foil and throw it away. So simple. Use a wire rack to lift the bacon off the pan. This helps to get each piece crispier. The heat permeates both the top and bottom at the same time. No flipping required! It’s okay if some of the brown sugar falls on the parchment paper because the syrup will eventually soak the entire pieces of bacon. It’ll seem like you don’t have enough bourbon to do the trick but as you drizzle it, the sugar will begin to soak it up. When it cooks, the syrup will bubble up and create a syrup on and around the bacon. A wire rack works great to cool the bacon when you remove it from the oven. Lay down a piece of parchment paper under the rack for the syrup drippings that occur. Be careful when removing the candied bacon from the oven and onto a wire rack because the syrup is extremely hot.